Foreword: My good friend, Amishi Shah, a graduate student of Public Policies and Administration at the Ohio State University, recently completed her thesis on engaging alumni through social media. I invited her to write a guest post on my blog and share the lessons she learned. I looked at the different ways through which Public Affairs colleges use social media sites – particularly Facebook, Twitter and LinkedIn - to connect with its alumni. I observed that some schools used social networking sites in a variety of ways and for various purposes, while there were some that do not have a dedicated social media presence for alumni – mainly due to lack of time and resources required to maintain and update the page frequently. One of the biggest reasons that individual departments should engage with alumni using social media channels, distinct from the University’s umbrella website, is that this would allow alumni to receive updates and information about their particular field of interest. For example, following or ‘liking’ an official university alumni page or profile will give you information about all schools – medical, business, arts, political science, etc. This can help you stay updated with key developments in your field, you may have otherwise missed. This is where having social media profiles for your school alumni will be truly important. 1.Schools use social media profiles for alumni to disseminate information about employment opportunities. At a time when the nation faces a high percentage of unemployment, this feature is useful for recent graduates who are looking for a job or those who are already employed and are looking to move up the ladder. 2. Another way that colleges use social networking sites is for professional networking. For example, there were some schools where LinkedIn was used by employed people who wanted to collaborate either with their former professors or others in their field. Former students had put their request on LinkedIn to get help from fellow members of that to collaborate for research or work purposes. 3. Some schools also had different groups within the alumni group. For example, there were groups for students living in Boston, Washington D.C, Chicago and other areas where more alumni live and work – providing greater possibilities for professional networking. My research also focused on potential issues with using social media to engage with alumni. These included questions such as: Are members comfortable with sharing all this information on social forums and also whether the college staff is concerned about inappropriate or negative comments? The Alumni Coordinators noted that the alumni are a very mature group and they are not worried about untowardly messages being posted on the alumni pages. One cautionary step that most schools take is to screen messages before they are posted on Facebook or LinkedIn. 1. Provide links for alumni to connect to the department’s Facebook and Twitter page from the department’s home page. 2. Posting one message a day would be appropriate. It has been reported that posting several messages a day overwhelms members, resulting in them opting out or stop following that page. 3. Personalize the messages, so that members feel connected to their alma mater. 4. Respond to members posts and comments that they may add to your post. This will make them feel that their suggestions are being heard and considered. Thanks for taking the time to write this post, Amishi. 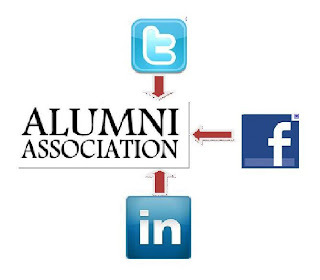 Social media is such a great tool for engaging alumni - who are already spending a lot of time on these networks. It would be interesting to see if engaging alumni through social media leads to an increase in donations to the school. That would help measure and prove the ROI of using these tools. I agree with a lot of what you said Amishi and appreciate your thorough explanation of social media in academia. In order to actively engage our alumni through social media at St. Joseph's College, we periodically ask them to tap into their memory of the College through Facebook posts. This act allows them to bring positive ideas of the College to the forefront and post more frequently and excitedly. We have seen some really great results. You are most welcome Farida. Thanks for this opportunity to write on your blog. It would be an interesting research topic to see if donations to the school increase because of engaging alumni through social media. From the data that I collected for my study, schools use social media mainly to provide networking opportunities and to highlight the individual school/ department's achievements. A very small percentage actively use these dedicated pages for alumni as a place to seek financial donations. If this increased, then it would benefit the school and also help prove the ROI of these tools. Thanks for taking the time out to read my guest post Mel. I really appreciate it. It is nice that the alumni of your college post messages frequently on their alumni page and keep it current. Some staff people I interviewed for my thesis said that they ask alumni during reunions or school functions as to how they can improve their alumni social media pages. And also the type of content that alumni are interested in seeing on these social media pages. Am really glad that your school has seen some great results! Good luck!